Entities like Youtube, Spotify, Pandora, Soundcloud and Last.fm, alongside the usual social dispersal mechanics of Facebook and Twitter, have certainly made it easier for people to get the music they want legally at minimal (if any) cost. These sites aren’t really doing a ton for artists yet, beyond making music from performers with already existing publishing deals more easily accessible to a wider audience. A great deal of ire has been directed toward Spotify in particular for the ridiculously low royalty rates it pays out to artists. It seems silly to cast Spotify as The Problem, since distributing music without fairly compensating its creators is already what most people are going to do one way or another. It’s important to remember, however, that Spotify probably shouldn’t be viewed as a likely solution to the music industry’s current crop of problems either. Regardless, Internet radio and subscription listening services have to be viewed as, at the very least, a step in the right direction for an “industry” with basically no viable mass financial structure in place at the moment. If there is an available outlet for an artist to target, this is it. It is a market pretty clearly on the rise. There had long been rumblings about hip-hop legend Dr. Dre’s development of a new music streaming-focused branch of his Beats Electronics audio equipment company. The revelation last December that Nine Inch Nails creator Trent Reznor had been brought on board the project as Chief Creative Officer made the enterprise even more intriguing. Certainly, celebrity musicians attaching their names to commercial projects is not particularly novel, but the combined reputation and industry experience of these particular celebrity musicians adds a fascinating angle to the in-progress streaming service, which is (unofficially) being referred to as Daisy. 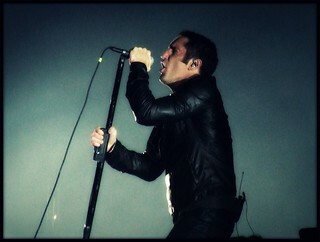 Both Dre and Reznor have been directly and successfully involved with pretty much every angle of the music industry. Both have been wildly popular performing and recording musicians in their own right. Both are viewed as recording and production visionaries within their particular genres. Both have operated legitimately successful and well respected record labels, wherein both were known to have taken a very hands-on approach to discovering and developing their artists. Both — particularly Reznor — have been extremely candid and open-minded about the issues facing musicians in the brave new Internet-driven world of music promotion and distribution. Basically, in neither case does this feel like a pop star allowing his or her name and face to be associated with caviar-infused vodka or some such thing; it feels a bit more like something that could actually turn into a serious market force. Well, the March announcement that Len Blavatnik, owner of the Warner Music Group, had invested $60 million in the project means it better turn into some kind of force now. Details of the specific function and implementation of the streaming service have been kept decidedly on the down-low, but the plan has already at least won the ear of Apple CEO Tim Cook. The pitch appears to involve a more financially viable model for musicians themselves, which isn’t particularly surprising given the personnel involved. But the really intriguing part of all this is the heightened attention the Daisy platform appears to be granting to the search and recommendation features. Now, “intelligent curation” is a really intriguing but delightfully vague expression of how the team is actually going to make this work. There are no details about the procedure and regulations with regard to artist submissions or access yet, so I’m jumping a few steps ahead here. But if Daisy is gearing up for a legitimate run against Spotify and Pandora and stays true to Reznor’s word, it’s going to very quickly make some form of SEO for musicians extraordinarily important. Even if Daisy underperforms relative to its recent investment, it will likely come on the market with enough clout to make other more established Internet radio sources at least think about altering or updating their approaches. In the interest of keeping this a series of (hopefully) easily digestible blog posts, and not an entire book, I’m going to keep the discussion of how the current main players in Internet radio actually DO approach things a bit limited. Know that there is much to be read on the subject, however, and it’s all pretty fascinating for music and Internet buffs alike. Pandora, in particular, makes heavy use of the Music Genome Project, which I could happily read about for weeks on end. For my purposes, let’s just establish that Pandora takes into account a whole lot of really detailed technical elements of how music sounds and how it is created when generating playlist connections. Spotify Radio (and many other Internet radio platforms) work more like they are pulling from a huge encyclopedia of genre and era-specific historical reference points, as if their databases are full of every NME Top 100 list and VH1 countdown ever made. Both the Pandora and the Spotify approach have their strengths and weaknesses, but where both run into issues is with brand new music that hasn’t been passed through the classification funnel yet. As Internet radio continues to grow and become a greater force in exposing new music to new listeners, it stands to reason that aspiring artists will want to provide as much information as possible about their musical material in order to make it easier to include alongside other more established artists’ material. What really intrigues me about all of this, though, is the idea of using SEO techniques to somehow link a band’s online “associations” in such a way that it might be reflected by Daisy or Spotify playlists. No matter how many hordes of ex-college radio DJs Trent Reznor and Dr. Dre are going to hire to add the supposed human element to Daisy, there is still going to be a lot left up to automated algorithms. What this means is…oh, hello there, schema, I didn’t even see you standing over there. Perhaps we should sit down and chat a minute in Part 4.